John Moore and Sons (Builders) Ltd is a family run building and construction company that is based in Clitheroe in the Ribble Valley in Lancashire, which operates in and around North Yorkshire and the North West of England. The business was founded nearly 30 years ago. The company is well respected locally by clients because of the team’s glowing reputation as reputable building contractors in Yorkshire. They’re also renowned for their attention to detail, their commitment to each job after taking on a contract, and for ensuring a high quality finish to all of their projects, which range from new builds to rebuilds, extensions and conversions. John Moore and Sons is registered with the National House Building Council (NHBC), and this means that customers can be assured of the highest construction standards with added consumer protection for each of their build and conversion projects. NHBC standards are accepted across the UK as the definitive national standards for construction, and this along with the NHBC warranties that cover registered builders’ work offers great peace of mind to clients. 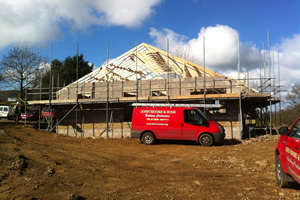 John Moore and Sons accept and complete contracts for residential, commercial and industrial builds and conversions, and as respected builders of projects both large and small they have a sound portfolio of previous work to support their excellent reputation. As a family run business, John Moore and Sons pride themselves on their trusted reputation and on building strong professional relationships with customers in order to offer a personalised service, and to better understand what is required from them for each individual project. As experts in quality building and stonework services, the company combines this personal touch with their specialist knowledge and expertise to work together with their customers to meet their requirements to the highest standard.